Ask fellow campers about "Dauphin Island Campground" and nearby attractions. All the reviews you read about crazy layout are dead on. Never seen anything like it. Very nice young lady checked us in. She gave us 2 options, one no way we could get in, no one got in there all week - Blue 21. 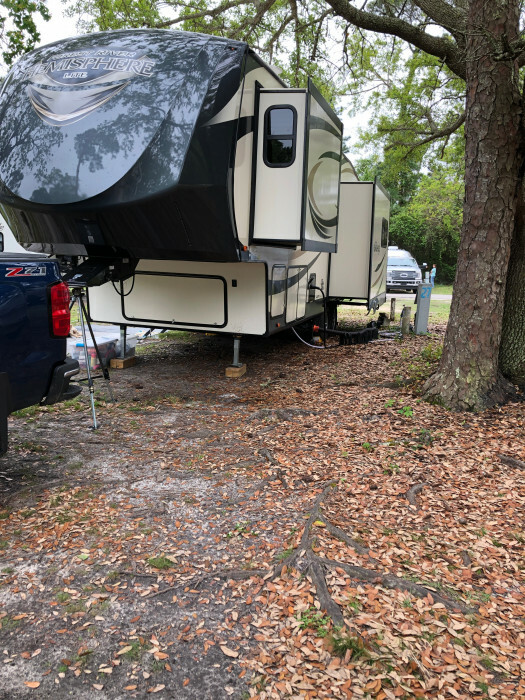 It's right by beach access, would have no neighbor on 1 side but with people parked right across the road, no way a 34' fifth wheel getting in Blue 21. Choice 2: Blue 27, we wanted sewer. Come to find out there were plenty other options. In 27 slide barely cleared tree. Site Blue 28 sewer is no lie, > 6 feet from 27 sitting area. The neighbor's sewer is going to be close to you. Fortunately no one showed up all week that could get in there. The site behind us ran horizontal. Our view from every window was a camper. The site is somewhat grass, somewhat sand, somewhat mud. It had rained a lot before we got there and after we got there. Restrooms/shower house was too far away for us to check out, there was a line for the ladies shower we noticed one night. It is gated and you will get an entrance card to scan yourself in. There are a couple of other gates you can get in by bike or foot. Very quiet at night, but again, one wicky wacky layout. Beach access is as you have probably already read, through a nice wooded area, then some boardwalk with a board needing to be replaced, dog leg found that. Beach is nice, water is muddy murky not nice. You cannot hear beach waves at the campground. It is extremely dog friendly. They are supposed to be on a leash at the beach but many did not comply and that one day will cause the beach to no longer be dog friendly I bet. Seems like you could at least comply with that, many beaches won't even allow pets. The west end beach at the end of Dauphin Island doesn't allow pets. We drove out to see the sunset and had to turn around because we had the dog. Went back next night without dog & of course there is a guy with his dog. Our 50 amp went out the first night there, sizzled. Repaired next day. Dumpsters all grouped together close to office only. 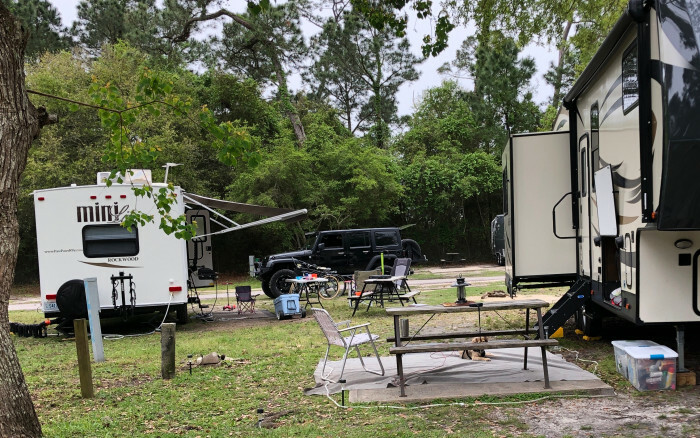 We camped at Dauphin Island Campground in a Fifth Wheel. Take your bikes. Bike trail runs entire island. Lots of places to stop and look for birds and at scenery. No restaurants were worthy of "outstanding" but at Islanders we got a great burger. The beach wasn't overly busy. The bird sanctuary is so nice. The main positive about this campground is the location. It can't be beat. It was within easy walking distance of the estuarium, Fort Gaines, the beach, etc. The restroom/shower building is in very good shape and the kids enjoyed the playground. As others have pointed out, the campground is a little cramped, but we had friendly neighbors and I learned a lot watching the procedures other people use when setting up and taking down camp. Food options are limited unless you are willing to drive or cook. We are likely to stay here again in the future, but primarily for the location. We camped at Dauphin Island Campground in a Travel Trailer. Take advantage of the nearby attractions, like the estuarium and the fort. They are not just a way to kill time... they are entertaining and informative. New bathrooms and laundry. Very clean. Spring break week very busy but after - empty. (Weather was not good for beach.) Had a great site; roomy with some shade. Some sites are very tight. Had a guy next to us park in our site. (Would have been nice if he had asked.) New playground kept kids busy. Very good place for bird watchers during migration. Ferry and oil rig supply boats dock nearby so you have that noise. We camped at Dauphin Island Campground in a Motorhome. Beach. Bird watching in migration. Peaceful, partly shaded, newly built bathhouse that was pristine. Decent WiFi near the pavilion. We camped at Dauphin Island Campground in a Motorhome. 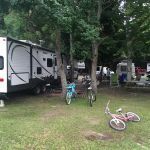 There have been negative reviews by others that state this campground looks like the majority of campers are long term, cramped spaces and unlevel spaces, and they are right. But, the campground grows on you after you are there and accept it for what it is. It is a place for fishing, taking your kids to enjoy the outdoors, enjoying access to a VERY clean beach and getting to know fellow campers. If you want pristine and perfect, this is not your place, but if you want to meet people and feel like you are camping in the woods, then this is a place for you. We camped at Dauphin Island Campground in a Motorhome. Get out and enjoy the water or take the ferry to Gulf Shores if you feel the need to get away. 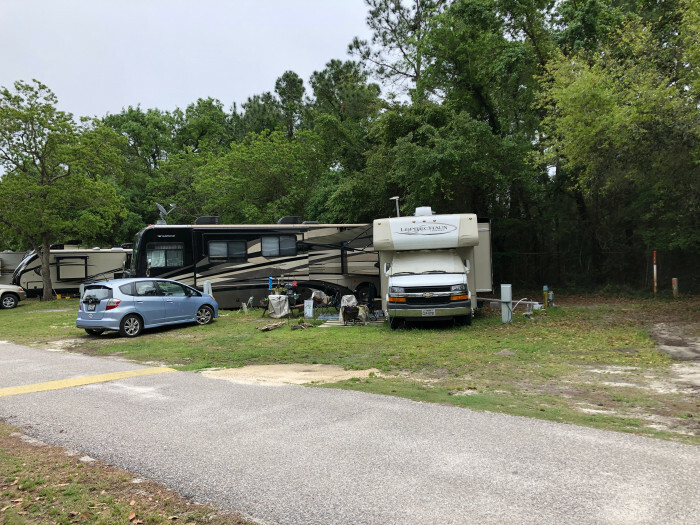 This is a unique campground on Dauphin Island. It is heavily treed and most all sites provide great shade. It is an older campground and some of the sites are oddly shaped and tight. A new bath house is being built and will be a nice addition. There is a small camp store to purchase ice, ice cream treats, snacks etc. The location of the campground was nice. It appears there are quite a few people who live at the campground full time or for an extended time. Many sites had multiple vehicles even though the rules say only 2 vehicles are permitted per site. Trucks, cars and boat trailers were crammed onto sites and I just wish the rules were enforced more about this. Having so many vehicles and trailers on the sites takes away from the nature and relaxing atmosphere of camping. There is a dedicated parking lot for boats & trailers, but not all campers seem to use this. For the most part this is a pretty quiet campground and worth a visit. We may come again in the future when the new bath house is finished and in hopes of less cars, trucks and boat trailers monopolizing the sites. We camped at Dauphin Island Campground in a Motorhome. There are many nature trails to explore close by, the beach is right down a long path, the Sea Lab is within walking or biking distance as well as Fort Gaines and the ferry. Pretty nice place. Beaches were prettier on the other side of the island so we preferred staying at that end. Was really quiet after dark. Would stay again although there are other campsites on the island that are much closer to the beach / restaurants which we preferred. We camped at Dauphin Island Campground in a Travel Trailer. I would have liked to stay, but my reservation was not honored. The previous weekend, we were passing through and stopped to check out the campground. It was crowded, but we always wanted to stay in the island. The office worker gave us a list if 6 sites available the next weekend. We picked the one that would fit our opposing slides and 50amp need. We paid. When we returned the following weekend, our site was being used. We were told they do not guarantee sites (not told before, and no, the sign in the office mixed with other signs was not noticed). The site available was not conducive to our slides. We traveled 1.5 hours to camp. This park was resistant to returning our money and not friendly. They have the only campground on the island. Had to find another place 35 mins away; luckily they had a site. We were really excited about our first stay on the island. If you do not guarantee sites, do not offer a pick to choose from when reserving. We camped at Dauphin Island Campground in a Travel Trailer. Sites are unreasonably close together. In fact, the neighbor's sewer hookup was right in our very narrow sitting area. And many of the sewer hookups are just pipes out of the ground where you cannot screw down the connection. The bath house is very old and past the point of getting clean. Gross. The redeeming part of the trip was close proximity to the Sea Lab and beach that allows dogs. We were looking for a close park to us for a quick getaway but will not return. We camped at Dauphin Island Campground in a Motorhome. Nice campground. Reminds me of camping at state parks. Wi-Fi is available in the pavilion, but if your site is close you can get Wi-Fi from you RV. Cable TV is available but depending on what site you have you may need 150' of cable to connect to it. Not all sites are full hookup. We would stay here again. We camped at Dauphin Island Campground in a Motorhome. Beach is an easy walk, as well as, Fort Gaines and the Estuarium. USS Alabama battleship is less than an hour away in Mobile Bay. The park doesn't have full hookups for all spots. We were in the drive through at 49 and its just a bad spot due to the inability to extend the awning because of the telephone pole and tree. Bathrooms for the mens was trashed later in the evenings. The cleaning crew comes in around 9:30am to clean up. From what I understand they are going to demo the bath house and build a new one. Over all the park is nice and was packed on the 4th of July week that we were their. It's a quick walk to the beach and to the ferry. Fort Gains is really close as well. Our kids love to play and everyone around watches the kids. Nice facilities for the kids to hang out and be occupied. You will not get any discounts here I tried Good Sam and they do not accept it. The other park on the island is extremely small we drove by just to check. We camped at Dauphin Island Campground in a Travel Trailer. The sites are on the small side and very close together. The power hook up for our neighbors site was on our patio. Most of the park is covered by tall pines and old oak trees. The island itself is very nice with some modern conveniences while maintaining that old Florida village feel. Don't forget you are on an island so come prepared to chill out and relax or drive 50 miles for some enterainment. We would stay here again. We camped at Dauphin Island Campground in a Travel Trailer. Price does not include tax and fees of almost $6. We detoured here from I-10 while on our way East. This is a great place to be near the beach. Nice walk through the woods to a fairly secluded beach. I would presume that's the primary reason to come to this campground. Not much going on in the community while we there and shopping/restaurants were limited but that's part of being on an island late in the fall. Many of the sites appeared to be occupied by early snow birders already. We would return if in the area but this would not be a destination trip for us. 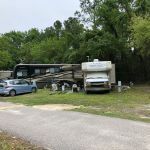 We camped at Dauphin Island Campground in a Fifth Wheel. Great location, a short walk thru woods to the beach. Sites are shaded, and dirt and are very close together. They are fine if its dry but if it rains our site flooded and were walking thru 4 inches of water during tear down. The rest rooms and showers are in need of a remodel and were often dirty. They advertise Wi-fi but is only available at the shelter house. Would consider staying here again but only for the beach. We camped at Dauphin Island Campground in a Travel Trailer. This is definitely a campground. I wouldn't stay longer than a few days...just enough time to visit the Estuarium, Fort and beaches. This island is definitely a bird lovers paradise and the campground is well situated for that. The sites are very uneven and heavily rooted. The wifi was down when we got there and remained down all week and the management didn't seem to care. The laundry is outdoors and was dirty and rusted. After the rain our sites and our neighbour's were filled with water - we were ankle deep at one point. 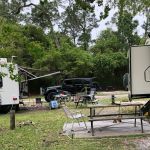 Great area for family camping and birders but I would stay in Gulf Shores and take the ferry for a day trip. 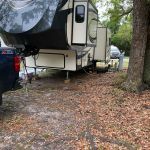 We camped at Dauphin Island Campground in a Fifth Wheel. Are you affiliated with Dauphin Island Campground ?